It's not your imagination: Abortion rights are under assault in the U.S. as never before. And you can thank a 2007 Supreme Court decision for the state-by-state onslaught. With Justice Sandra Day O'Connor in the majority, the court ruled 5 to 4 that Nebraska's law violated abortion rights established in Roe and affirmed in Planned Parenthood v. Casey because it did not contain an exemption for allowing the procedure when a woman's health was threatened. But in 2007, with O'Connor replaced by Alito, the court in Gonzales upheld a federal ban on the procedure that did not include such an exception. There was also some language from Justice Anthony Kennedy in his majority opinion that inspired opponents of abortion — and soundly pissed off Ruth Bader Ginsburg, among others. He claimed Casey had established that "government has a legitimate and substantial interest in preserving and promoting fetal life," and with regards to the so-called "partial birth abortion" procedure, "It is self-evident that a mother who comes to regret her choice to abort must struggle with grief more anguished and sorrow more profound" at the details of the procedure. Ginsburg replied in her dissent, "This way of thinking reflects ancient notions of women's place in the family and under the Constitution... [which] have long since been discredited." It's taken a few years for the legislative process to churn, but several anti-abortion politicians in state legislatures — notably, Nebraska — say in the piece they were inspired by the decision, and are basically daring someone (Planned Parenthood, or the Center For Reproductive Rights) to challenge their laws. 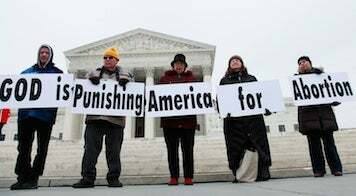 That way, they figure, they can get even more affirmation from the Supreme Court, and maybe even topple Roe.